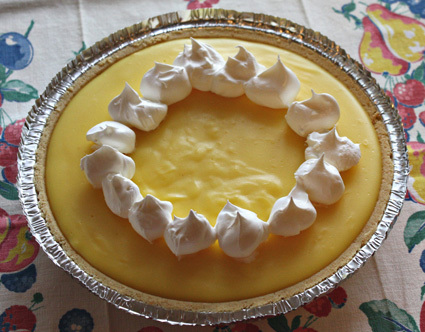 FoodBasics101: Banana Pudding Pie Recipe- Banana pudding flavor with less fuss. Banana Pudding Pie Recipe- Banana pudding flavor with less fuss. My hubby loves banana pudding but sometimes I don't have the time to make the pudding and meringue from scratch. I created this quicker version so we can have that banana pudding flavor more often. Hubby says this pie is A-1. I was considering naming it "A-1 Banana Puddin' Pie" but then I thought it would sound too much like the steak sauce. LOL! Combine pudding mix and milk in a medium saucepan. Cook over medium-low heat stirring constantly until mixture comes to a boil. Immediately remove from heat. Stir in butter and vanilla extract. Let cool. While the pudding is cooling, slice the bananas and place them in the pie crust, evenly covering the bottom. Stir pudding again and pour into pie shell. (You will have about a cup leftover for snacking.) Chill pie in refrigerator. Spread whipped topping on top of pie before serving. Serves 8.